If ever there is a time to discover the heartbeat of Asheville, then a Friday evening in late spring generally reveals the city at its truest—folks emerging out of sleepy social hibernation, ready to revel in art and music, sustenance and camaraderie, all under the growing skyline of a pretty Art Deco nucleus. Whenever I’m traveling for long periods of time, invariably upon my return, a downtown visit to my long-ago adopted town will reveal new storefronts—a new gallery here, a wine bar there. To me, it shows a devotion to a city that works on a human basis, where the individual and its small scale is valued above concrete and steel. The largely residential downtown means people at all hours of the morning and night using the city’s infrastructure—patronizing the corner café for its morning latte and copies of the New York Times; friends joining friends at their favorite microbrewery pub after a hard day’s work. Yet the many galleries, shopping emporiums such as the Grove Arcade, forward clothing boutiques, and a plethora of restaurants appeal to the weekend out-of-towner and locals alike. It’s not only a perfect walking town, it’s a mini-metropolis that’s easy to make your own. As I wander the city on a recent spring afternoon, all I have to do is look up to find telltale Art Deco curvilinear forms peppered throughout downtown on buildings as significant as City Hall and in architectural embellishments as benign as park benches. Much of Asheville’s city center was saved from the wrecking ball, not once, but twice. After the 1929 stock market crash, Asheville shouldered a debt that it did not pay off until the mid-1970s, tying up public funds and making urban renewal impossible, but consequently keeping the downtown intact. Then in the 1970s and ’80s, after major department stores had moved to the suburban shopping strips, parts of the sleepy downtown were threatened by annihilation in favor of a proposed downtown mall. Only citizen reaction quelled that threat. Traditional architecture abounds throughout Asheville, as well. The historic Montford neighborhood boasts rows upon rows of stately Georgians, colorful Queen Annes, lovingly restored Victorians, and gone-green Arts and Crafts bungalows—all but a brief walk from downtown. This day, I wander from a block of Montford’s graceful B&Bs to the Battery Park Book Exchange and Champagne Bar, a recently opened gathering place created by Donna and Thomas Wright, owners of the Jazzy Giraffe clothing boutique, located in the Grove Arcade across the way. The tome-filled establishment perches in a corner of the former Battery Park Hotel, a deep-red-brick high-rise on Asheville’s skyline. Alcoves with cushy chairs and a black marble-topped bar invite sitting and sipping. 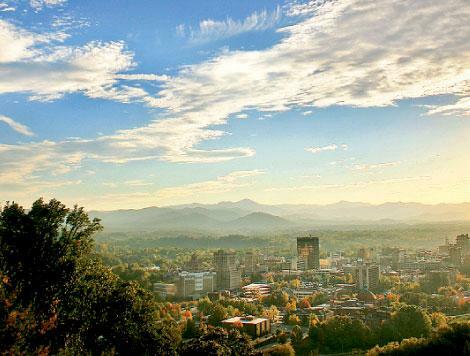 Indeed, the urban landscape may have changed from what existed a century ago, but Asheville’s innate allure has never wavered. It has long attracted well-heeled folk from larger urban areas—be it to escape the Southern summer heat, discover a place of rejuvenation, or simply to gain inspiration from the placid mountain ridges that hug its outskirts. From the pink-roofed City Hall to the copper-domed First Baptist Church, the gilded S&W Cafeteria, the monolithic city high school, and other such structures now continue to stand as an ode to a buoyant era of design, when some sixty-five buildings were erected in the 1920s alone. It’s hard to imagine a more timeless spot as I wander through the white monolith that is the Grove Arcade—conceptualized by Edwin W. Grove of Grove Park Inn fame shortly before he died in 1927 (two years before its completion). Little shops, a green-grocer market, café, and fruit stalls fill its gleaming interior. And here, Santé Wine Bar offers bottles and bites for taking out or drinking in, while Restaurant Row on the Arcade’s east side creates a conundrum as to what cuisine I’ll be trying tonight. Italian? Thai? South American? Californian? Thinking it over, I continue to wander past Pritchard Park’s amphitheater, discovering what this wall of sound that I’ve been hearing for blocks actually is. The Friday-night drum circle has amassed a writhing group of dancers, gyrating with clear abandon to the rhythm of twenty drums. I join the large group of onlookers—some taking pictures, others leaving jackets with friends to jump in for a moment of spontaneous dancing. Receiving a call from friends to meet them for a snack, I pass a trio of ragamuffin-looking buskers playing a decent round of Old Time music by the giant iron on the corner of Wall Street and Battery Park Avenue. The nine-foot-tall sculpture, perched in front of the Flat Iron building is one of thirty sculptures and plaques that compose Asheville’s Urban Trail, a “museum without walls” on a 1.7-mile walk throughout the city that chronicles Asheville’s history. I’ve arrived during the bi-monthly gallery art walk. Purple and gold flags indicate which galleries are open, usually featuring new exhibitions and crowds of well-wishers inside. At least thirty downtown galleries participate, making for a pleasant stroll about town for viewing Impressionist landscapes at 16 Patton, figurative works at Gallery Minerva, Blue Spiral for three floors of fine crafts, sculptures, and paintings, the Bender Gallery for luminous glass, and many more. I meet my friends in a velvet-cushioned alcove inside Zambra, a tapas bar of creative design borrowing from Moorish and Middle Eastern patterns. Our group orders small plates of coffee-marinated shredded pork, Spanish cheeses with a spicy chutney garnish, pear and goat cheese salad, spicy spring rolls with sweet and sour avocado dipping sauce, and countless more. This we wash down with Spanish reds, fruity sangria, and nutty dry port thereafter. Bouchon, a lively bistro on funky Lexington Avenue (a street of music shops, interior décor stores, and second-hand sales) dishing up “French comfort food,” catches our attention with its mussels and frites plate. The herbed shoestring fries with rémoulade dipping sauce are too tempting to pass up, even after our fill of tapas. And the eclectic Asheville evening has much more in store. The Rankin Vault, a low-key mostly-locals hangout, sees a parade of artists and attorneys alike, sipping local microbrews and blood-orange martinis as they listen to DJs spinning new music. Artist Dustin Spagnola, a Warren Wilson College graduate, serves up chorizo tacos some nights. Deep red curtains and banquets lend a theatrical air, while the actual vault behind a propped-open steel door is positively vaudevillian—all floor-to-ceiling flouncy curtains and satin. This evening, I opt to check out late-night Asheville at Bobo Gallery. This art-house wine lounge offers only beer, wine, water, soda, and coffee, but hosts quirky bands and DJs in its cozy two-room space. The upper tier turns into a disco with fans happily jostling shoulder-to-shoulder to get their groove on. I sip my glass of cold Prosecco, eyeing the owner’s collection of local art displayed on the raw-brick walls, much of it from promising young artists with recent, locally earned BFAs. As I wander back to my own neighborhood just off downtown, the Frog Bar on the corner of Haywood Street and Battery Park is still going strong with revelers sitting under the blooming Bosc pear trees late into the night. Morning in Asheville shows promise for an adventurous day. The air is mild, fresh. Views beyond the ever-growing skyline showcase those peaceful ridges that I want to see up close. My more sports-inclined friends might take the opportunity to pedal their mountain bikes up the burn-inducing Town Mountain Road after a protein-filled organic breakfast at Early Girl Eatery—black bean cakes, pumpkin bread, Greek omelets. I speed past them (in a gas-powered vehicle) snaking upwards quickly and onto the Blue Ridge Parkway high above town. Multiple shades of green dapple the wizened humps and valleys below as I guide my car along this scenic drive that began in the 1930s as a Depression-era public works project. Ultimately, the parkway was more than a half-century in the making. I can go north to Mount Mitchell, an hour away and the highest point east of the Mississippi, or turn the other way to Craggy Gardens and the bountiful azalea fields for a picnic, or head onward to peaked Mount Pisgah. Instead, I steer off the parkway at the Folk Art Center to view traditional craft exhibits in the airy galleries. A display of patterned quilts hanging ceiling to floor shares space with intricate wood carvings on the upper levels. The Southern Highland Craft Guild artisans showcase their wares here, for sale in the Allanstand Craft Shop, on the ground floor. On weekends, demonstrations of broom making or basket weaving edify visitors. With no time for a proper hike today, I return to the urban jungle, checking in on one of my favorite off-the-beaten-path areas: The River Arts District in Asheville’s industrial warehouse section always inspires me—if not to take up an artful hobby, then at least to purchase an original from the studios where they are made. More than ninety artists populate these spacious spaces (most of which open their doors en masse in June and November for the River District Studio Stroll). But a few of the newly established galleries and several studios have fortunately decided to keep their doors open every weekend. The Wedge Brewing Company has opened inside the Wedge Studios, pouring forth frothy Iron Ale IPA, Russian Imperial Stout, and Payne’s Pale Ale, named after the late metal sculptor John Payne who owned the Wedge and gave many an artist their professional home. The dusty railroad tracks and cloudy French Broad River on view from the deck offer ample inspiration for resident artists, indeed. I encounter Clingman Café on a parallel street. Women in gauzy skirts, their long hair catching the sun, take breaks from the potter’s wheel in nearby Odyssey Center for the Ceramic Arts to lunch at sidewalk tables. I consider this thriving art colony over a cranberry smoked-turkey club with avocado, surrounded by cheery pastel ceramic sculptures and framed photographs on the bright walls. I’m meeting friends again later for an evening of music, first at Orange Peel Social Aid and Pleasure Club (a refurbished roller rink that has hosted the Smashing Pumpkins and other national and regional acts), then perhaps a quieter Celtic music jam at the Jack of the Wood pub. Tomorrow is a brand-new day in Asheville—perhaps time to explore the charming pebble-dash town within a town that is Biltmore Village, outside the grand Biltmore Estate. Or perhaps back to the heart of downtown, to experience more enterprises and individuals that keep the beat of this vibrant place.